Cell phone mascots are generally the last thing anyone thinks of when they think video games, especially when said mascots are for companies halfway around the world. From what I can gather, Docomodake is actually fairly popular in Japan, and it even gives foreigners useful tips on traveling in Japan. Upon laying eyes on this game, I had no idea what to expect. The idea of a video game based on a cell phone mascot seemed about as good an idea as a video game involving the Geico cavemen (wait, I shouldn’t be giving them ideas…), especially considering how well the sitcom about said cavemen panned out. But then, Ignition is the publisher behind such titles as Bubble Bobble Double Shot (which won our “Best Puzzle Game” award), Metal Slug 7, King of Fighters ’98 Ultimate Match. That’s actually a pretty good track record, which left me feeling a bit more optimistic going into this game after I got done boggling at the premise and giggling about being sent (digital) Japanese shrooms. The story involves a annual festival in Docomodake Village. However, every member of the Docomodake family except Papa Docomodake vanishes as they set out to make preparations. It then falls to Papa Docomodake to find them all so that the festival can start on time. The story is fairly minimal and plays out in a series of short cutscenes between areas. These little vignettes emphasize the virtues of family and manage to come off as cute and sweet rather than heavyhanded or overly corny. While it’s not the deepest plot ever, it’s more than what you’d expect out of a game like this. The graphics certainly don’t push the DS’s capacities (it wouldn’t really even push the GBA’s), but they’re functional and look good. The sprites have a good level of detail (well, as detailed as mushrooms can get, anyway) and are brightly colored. Each member of the Docomodake family looks distinct and not like clones of each other in varying sizes. The little cutscenes are adorable and drawn well, if simply. During gameplay, the the top screen will display in fraction form the amount of minis currently out over the maximum you have, the number of chests you’ve opened over the total in a stage, and the number of coins over the total possible to obtain in that stage. In addition, the beleaguered family member you are currently searching for is also shown, reminding you of your goal in life – I mean, for that area. The layout’s a bit spartan, but it works. The bottom screen is where all the action takes place and is uncluttered save for two icons on the bottom left corner. The glasses icon will bring up Stage Viewer, while lets you scroll the screen around, get a lay of the land, and plan accordingly. 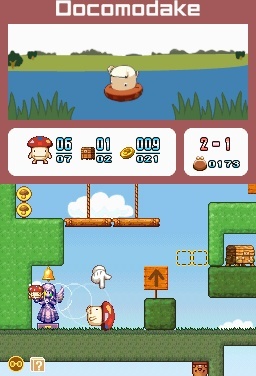 The question mark icon brings up a catalog of the different mechanisms used in the game and flashes whenever you encounter a new one. The music that accompanies your rescue mission is rather light and upbeat. Some of the tracks are actually kind of catchy. 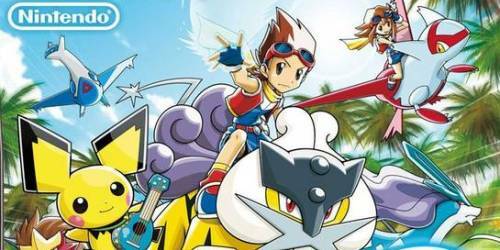 It probably won’t compel you to pine away for an OST to put on your mp3 player of choice – or for ringtones, since the game does star a cell phone mascot – but they’re pleasant to listen to. Whenever you complete a stage, a young sounding chorus cheers for your victory by singing “Doco” repeatedly. The sound effects consist of the expected chimes whenever you pick up coins or successfully hit a switch or series of switches. The latter helps when you’re blindly trying to hit a faraway offscreen switch since it’s one of the only indicators (besides the stage viewer, and you can’t do anything while in that mode) that you did indeed hit that switch. The controls involve both the stylus and the buttons, which is actually not as cumbersome as it sounds, hard as that may be to believe. 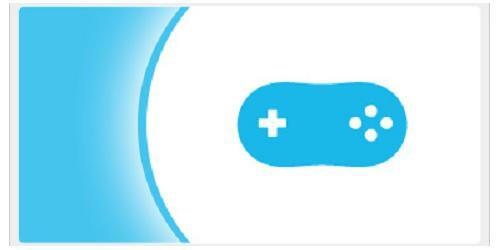 The tutorial, while brief, is helpful if you need help or practice with getting the hang of the controls. You move Papa with the D-pad and jump with the A button. Pressing start will bring up the pause menu, where you can access the stage viewer and mechanisms list (if for whatever reason you didn’t feel like using the icons on the bottom screen), restart the stage, or return to the World Map. 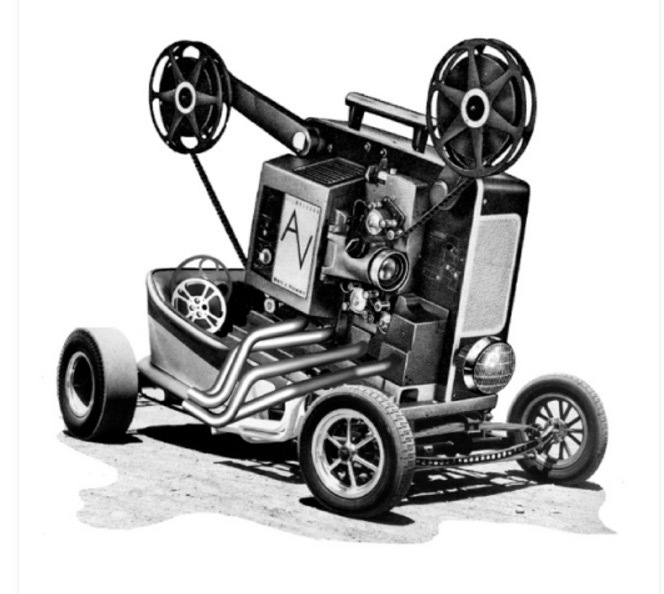 To bring forth one of the minis inside Papa, tap on him, or push one of the trigger buttons to unleash several at once. As more minis are released, Papa gets smaller; of course, the reverse is also true, as the more minis he merges with, the larger he gets. Doubling tapping the hand above his head will cause it to beckon all the minis currently out and remerge them with Papa, no matter where in the stage they are. Why he would have a giant floating hand over his head following him everywhere he goes is a mystery, but the hand serves a purpose – can’t complaint about that. 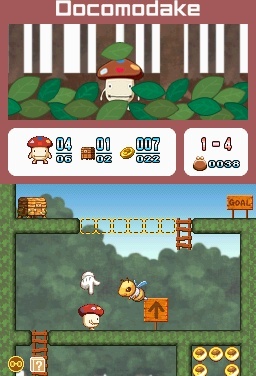 The game is an interesting fusion of puzzle and platformer elements. On the one hand, you run around making leap after daring leap, fend off enemies, and collecting coins along the way towards a goalpoint a la Mario games. On the other hand, you’ll often be required to navigate stages by manipulating your size to fit in small passages, be able to push around boulders, weigh down platforms as needed, or guide minis around various obstacles to get to out-of-reach switches. For example, you may need to keep yourself a large enough size to move a boulder, but then have to shrink yourself in order to fit into a narrow passage that was behind the boulder. On some levels, you’ll have to put minis through warp stumps in order to reach switches, and some switches won’t stay down unless you leave the mini on there. Naturally, your trek will not go unimpeded. If Papa gets hit by an enemy or spikes, he will lose minis, and if he sustains too many hits, it’s the end for him. You control minis by dragging them around with the stylus. Double tapping one will result in it rolling up into a roly-poly, and you can walk into it to pick it up, then tap a direction you want it to go to throw it. The mini will become dizzy after you throw it or if it collides into an obstacle or enemy. The only way to retrieve that vertiginous mini is to manually drag it back to Papa; a mass recall will not work, which is a pain if they’re afar. Should you fail to do so, the unfortunate mini will turn into a transparent floating angel that hovers near Papa (man, again with the floating things around Papa) and can only be revived by a bell statue. You can also make the phantasmic mini flutter about by blowing into the microphone, but that would only really be useful for getting the mini near a bell statue, and even then just walking up to the statue with Papa would be more efficient. At times, I found positioning the screen so that both Papa and the mini were visible a bit frustrating, as I couldn’t drag the mini back to Papa unless they were both on screen, and this would cost me the mini. Fortunately, the game does give you enough minis (as long as you open every chest) and bell statues to get by. You can also position one near somewhere you want to ascend, then stack others on top of that mini to form a ladder. This came in handy many times, and Papa usually jumped high enough that I didn’t need to build a very tall ladder. Drawing a circle around a group affords you control of that group of minis so that you can move several at once. To be honest, I didn’t really use that particular function, but if it helps you, there you go. After you beat the first five areas, a line of minis will march up, lift the world map, and shift it over to reveal a new area. Once you’ve beaten that area and the credits finish rolling, a bonus area reveals itself to you. The fact that there’s these two hidden areas is a pleasant surprise. Buying out everything in the collection section does serve as a decent motivator for replaying stages, especially considering coins are not particularly onerous to accumulate. It contains all the prologues and epilogues for each area, all the music in the game, and a double jump ability that only shows up once you’ve beaten every area. However, there might not be a chance to use that ability, after you’ve beaten every level, unlocked everything, and bought everything in the collection section, there’s not much incentive to keep playing. While it is fun to play around with and makes stages even more of a breeze, the addition of that ability feels like too little, too late. Sure, you can try for higher scores on each stage, as a star appears on stages you earned a B or better on (highest is an S). But there’s also no reward if you earn an S for every stage. The only things that count towards your score are the time it took for you to reach the goal and the percentage of chests and coins you collected. Some stages do get somewhat tricky, and you do have to think a bit before proceeding since it’s entirely possible to get yourself stuck somewhere and have to retry that stage. For instance, I’d forget to leave some minis behind to weigh down one side of a balance and end up trapped under said balance, or I’d move a boulder too far and trap myself somewhere. However, the overall difficulty does lean on the easy side, and you’ll likely find yourself going through the game relatively quickly, depending on how often you restart a stage or whether you keep repeating stages to gather coins. I never once had Papa keel over on me, although I did sometimes lose minis, and I’d end some stages with few minis left. The combination of puzzler and platformer is an interesting one, and they complement each other nicely here. There are some clever puzzles integrating the use of minis and weights of both Papa and the minis. 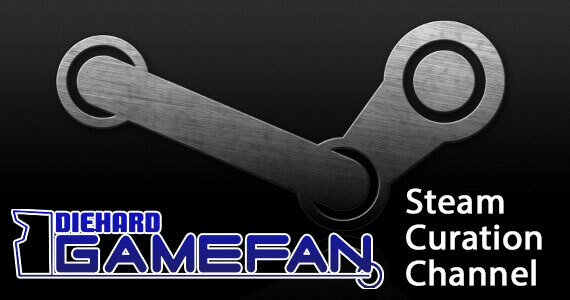 At the same time, there’s enough platforming for platformer fans to not get bored from lack of action. Both were blended well to form one unique gaming experience that could only be pulled off on the DS, considering how much the touch screen factors into the gameplay. Despite my initial skepticism, I found myself glued to this and wanting to get to the next stage as soon as I finished one stage. I’d go through stages again if I missed any chests or coins. Even having to restart stages didn’t bother me that much, and I was able to figure out what I had done wrong and correct it the next time around. After seeing and completing every stage, however, the novelty waned a bit, but I still enjoyed going through every stage to earn enough coins to unlock everything in the collection section. Our little fungus friend lacks the name recognition he would have in Japan, so the game does not have that hook helping it to move copies. Some might find the game a bit too peculiar and Japanese for their tastes and avoid it, further illustrating the lack of mainstream appeal this game has. Those who do like the DS for the quirky titles in its library will likely give this a second look and pick it up. 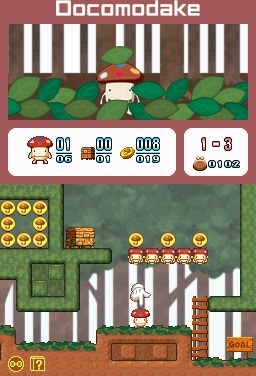 Young children may also be drawn to the title because of its cartoonish veneer, and due to the lowish difficulty, the game would be doable for them. Overall, while the game was a strange choice to translate and bring over, it proved to be an apt one. It could have used some more content, as there isn’t really any other modes to play through besides the main story and little to do once you’ve finished that. 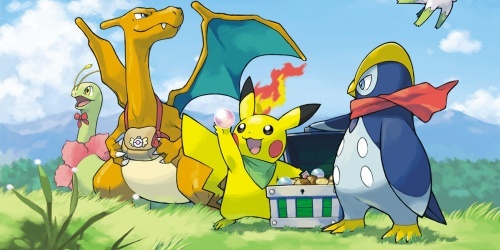 Completing game only takes around four hours, possibly a bit more if you hunt for coins to fatten your coin pouch with, and that’s including the unlockable areas. But it colors outside the lines in terms of gameplay and manages to pull it off and make it look good without crossing the line into gimmickry. BOING! 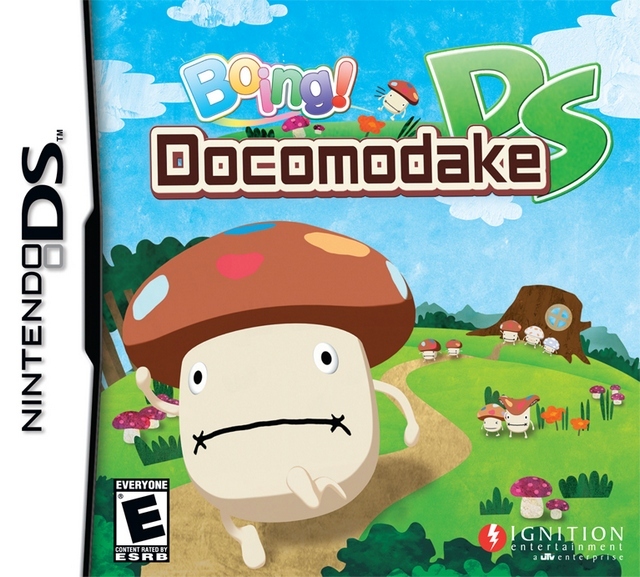 Docomodake is a rather odd choice for a game to localize, but it was a good one, even if the eponymous character is unrecognizable to most outside of Japan. Some might find the game too easy and short, and even for $20 the content feels slightly flimsy for the price. Nonetheless, it’s still a fun game that utilizes the touch screen well in presenting some clever puzzles and is worth a look if you like puzzles and platformers. Aileen Coe is an associate editor at Diehard GameFAN who specializes in Japanese RPGs and quirky portable titles. She is also a former reporter for The Sophian, Smith College's student-run newspaper. Sounds like it would be worth it! Awesome review! Thanks! And yeah, it is definitely worth playing through.